Our two kings face off in a special match . . . taking place in a boxing ring! 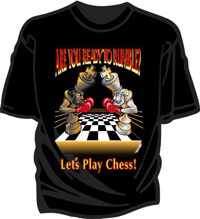 This T-shirt with that famous old saying, "Are You Ready to Rumble?" provides another place for these opposing kings to fight it out. 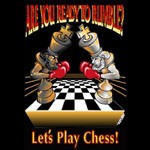 Shirt reads: "Are You Ready to Rumble? Let's Play Chess!" NOW AVAILABLE IN ADULT SIZES UP TO 6XL!